For all orders of multiple bottles of 3 kg (6 lb) or 15 kg (33 lb) sizes, read the important shipping information down below before ordering. *Our 15 kg/33 lb size is not available to be shipped outside of the United States or Canada without making prior shipping arrangements with Customer Support. The 15 kg (33 lb) size does not qualify for free shipping due to the extreme weight and size. A flat rate shipping fee per container is charged. Orders of 4 or more pails of the 3 kg (6.6 lb) pails of honey are excluded from the Free Shipping Offer . If you order 4 or more 3 kg (6.6 lb) pails of honey and select the Free Shipping option during checkout, your order will not be shipped. Please select Standard Shipping when ordering 4 or more pails. Honey orders of 10 kgs or more do NOT qualify for free shipping to the United States or Western/Eastern Canada. Do not select the Free Shipping option if your honey order is 10 kgs or more. You must select Standard Shipping. If Free Shipping is selected, your order will not ship. 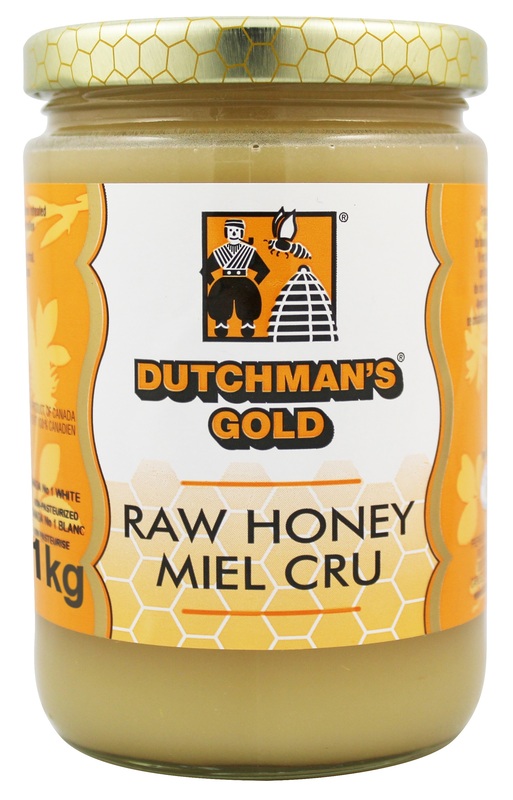 We've taken our famous Dutchman's Gold bee pollen and mixed it with our unpasteurized Creamed Honey to give you the best of both worlds in one product! It contains 5% bee pollen by weight (approximately 25 grams of pollen). Available in 500 g glass bottles. **Please note that it is perfectly normal upon opening to have a powdery, yellow layer of pollen at the top of the jar. This is the actual pollen and should be consumed. "I find that the energy from your raw honey with pollen is remarkable!" Our Blueberry Blossom honey is a bold, full bodied honey with a fruity finish. It was created by honey bees as they diligently pollinate the blueberry fields! This honey will enhance any recipe that calls for honey! And as always, this honey is un-pasteurized! Available in 500g (1.1 lbs) and 1 kg (2.2 lbs) glass bottles, our buckwheat honey is a darker honey with a strong, robust flavor. It is derived from the increasingly rare Buckwheat blossom and is perfect as your favorite spread or for baking. Like all of our honey products, it is unpasteurized. Our convenient Honey Stix are perfect for those of you on the go! If you're avoiding the many dangerous sweeteners out there, these are nature's answer. Each Honey Stix contains 5 g of our Summer Blossom unpasteurized liquid honey in an easily opened mini packet, perfect for your morning coffee or afternoon latte! For those carb watchers, there is less than one gram of carbs per stix. Available in 500 g and 1 kg glass bottles as well as 500 g, 1 kg and 3 kg plastic bottles, our Summer Blossom honey is our most popular liquid honey! The floral sources of our Summer Blossom honey are primarily Clover, Alfalfa, Basswood and Canola blossoms. Also available in a 15 kg pail. Unpasteurized. "My family and I find your honey superior in taste to any other that we've ever tasted!" *Orders of 4 or more pails of the 3 kg (6.6 lb) pails of honey are excluded from the Free Shipping Offer . If you order 4 or more 3 kg (6.6 lb) pails of honey and select the Free Shipping option during checkout, you're order will not be shipped. Please select Standard Shipping when ordering 4 or more pails. Our Wildflower honey is a full bodied, distinctively aromatic honey created from a bouquet of Golden Rod, Aster and late summer wildflowers. Add to any recipe for a distinctive taste!